It’s Hayley and Bill, from The Food Lovers Kitchen. 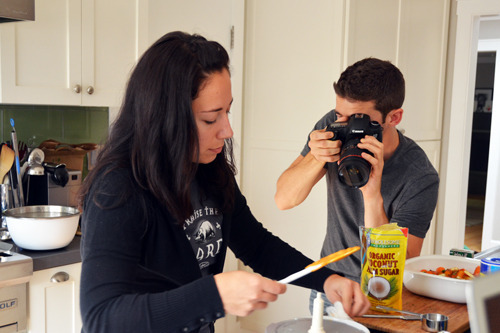 Today, we hijacked Nom Nom Paleo’s home, kitchen, and have now taken over her blog as well! We’re in town for the Weston A. Price Conference to be held Friday through Sunday in nearby Santa Clara. 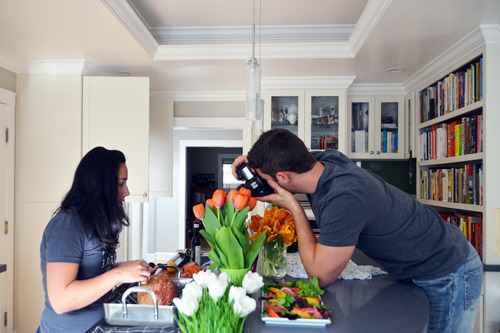 Before flying in to town, we demanded begged Michelle to let us shoot some photos in her gorgeous kitchen for our upcoming cookbook, Gather. The shoot went flawlessly, despite the intense jet lag (don’t mind the dark circles and lack of makeup! -Hayley). And best of all, we only had to tie up one small child (Lil-O) to get our work done…Big-O was at school! This morning we woke up bright and early to the sound of little voices saying “Where’s Bill and Hayley? Where’s Bill and Hayley?” Then after a quick bite of bacon, Michelle and Lil-O took us shopping around town to grab the remaining necessities for our shoot. When we got back, we quickly set to work (though it looked more like destruction and chaos). 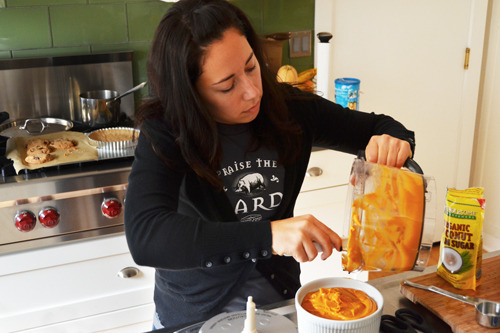 While “in reality” we would normally prepare a lot of food ahead of time if we were truly throwing a party, this was a one-day ordeal with we couldn’t have accomplished without Michelle helping us. She was the best! We’ve come to learn that each shoot brings its own set of unique challenges and constraints, and this one was no different. 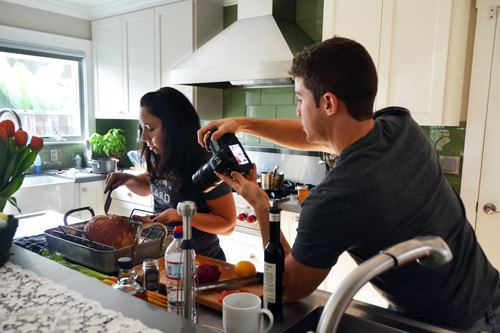 For this particular shoot, we were racing to capture the photos with ample daylight. Given the recent time change, we knew we would lose light around 4:30 – so every second counted! Despite the challenge of hurrying to execute six dishes in just a few hours, everything turned out great and we are very happy with the results! Thanks for letting us take over the blog, folks. Michelle sends her best – she’ll be back tomorrow (maybe).